When people stay at a hotel, they expect a different experience from that of their home life. People often enjoy staying in hotels because of their beauty, their luxury, and their presentation. Beyond all of that, one thing that sticks in a guest’s mind after they leave a hotel is the striking interior design – especially the lighting choices. Many hotels are set apart from their competition by having the best custom lighting solutions in their foyers, their lobby, and their waiting areas. 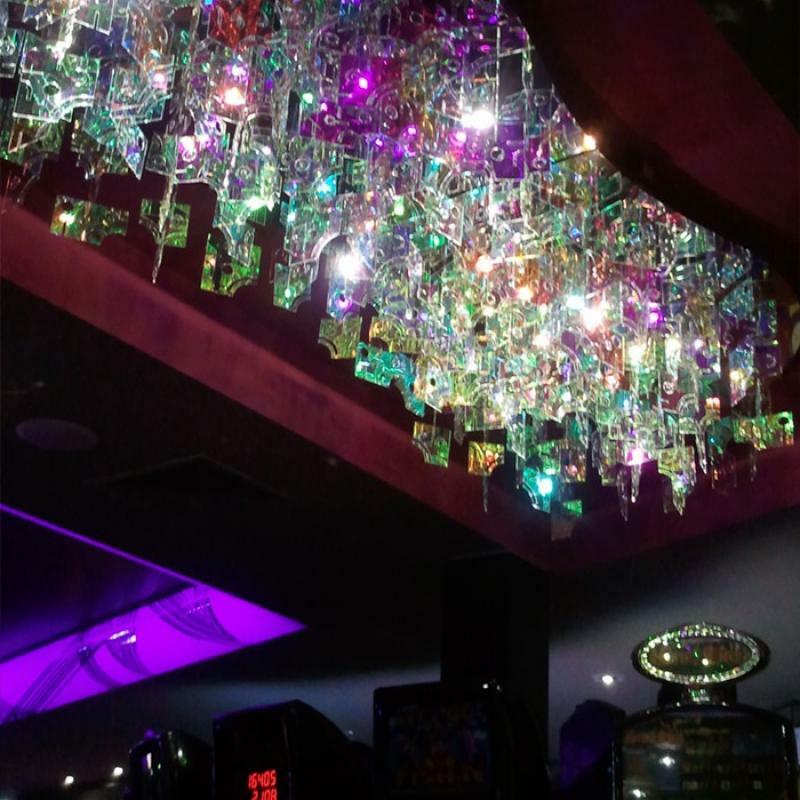 When a hotel features a unique custom lighting design, it is clearly evident to anyone who sees it. In contrast to a hotel that uses mass-produced lighting fixtures you could find in any home, custom lighting makes a shining impression on a hotel’s guests. Both guests and employees alike can benefit from a beautiful lighting arrangement in their hotel. Custom lighting can also make the difference between a four star and a five star rating for your hotel. These kinds of lighting solutions bring out the luxury in everything around them, even if other pieces of décor or interior styling are not actually as high-quality as the custom lighting installation. Ask any film maker, photographer, or theatre lighting technician and they will tell you that lighting is crucial to bringing out a specific style and emotion that you want your guests to feel when they enter your hotel. This custom piece used our Pezzettino lighting fixture, which is custom designed with a rich collection of greens, purples, and yellows all ineffably combined into the same translucent colour pallet. This colour pallet is a bright splash of light that brings out the other colours in the décor and on the floor. This project perfectly uses the space it has available by nestling the custom lighting piece right where it needs to be in an indent in the ceiling. Without this custom lighting piece, the floor would appear dark and uninteresting, whereas with the custom lighting, the place looks classy and stylish. 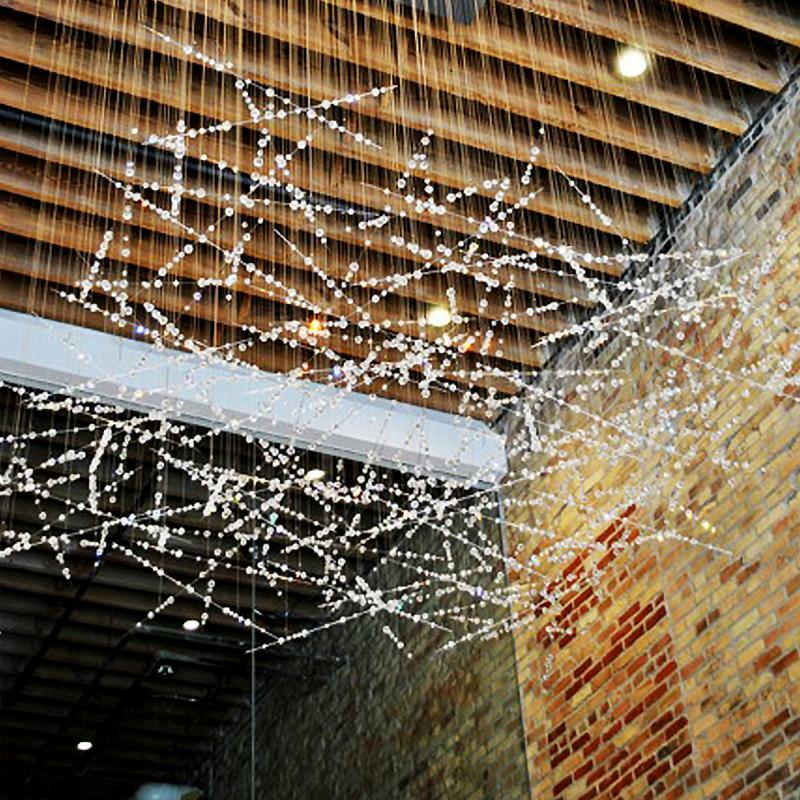 This custom lighting project features our Shooting Stars piece, which is great for filling up an open space. This piece makes an empty open ceiling full in a unique and beautiful way. The delicateness of the crystals contrasts excellently with the controlled aesthetic chaos of the hard lines hanging suspended in the air. This beautiful cloud of ice and pearls on strings is sure to leave your guests wide-eyed and pleased with the décor. This piece can be adapted and customised to fix whichever space it hangs in, and the crystal clear nature of its colour guarantees it will compliment any colour pallet it is placed within. Whether you have a reclaimed, open look or a streamline renovated building, this custom lighting installation can work wonders for your hotel’s presentation. Don’t get left behind when it comes to new trends in hotel interior design – invest in some custom lighting work to set your hotel apart from the competition. It could be the best decision you’ll ever make for your business!